MODERN DETACHED FAMILY HOME IN A PRIVATE CUL DE SAC POSITION. With four double bedrooms, two ensuites, double garage and south facing landscaped garden. WILBURTON is a popular village about 6 miles south of Ely and about 12 miles north of Cambridge. There is a village primary school, post office/store and further shops and a health centre available at nearby Haddenham (one mile). The Ely train station is a 15 minute drive away and provides fast access into Cambridge and London. Secondary schooling is available at Witchford, about 4 miles away, or Cottenham Village College which also has a bus service provided by local parents. THE PROPERTY stands detached to double fronted design and offers spacious family oriented accommodation. There are four double bedrooms, two of which have ensuites, a lounge with wood burner, dining room, a well equipped kitchen/diner, conservatory and study. The rear garden faces south and has been beautifully landscaped, and to the front there is a double garage and driveway parking for two cars. ENTRANCE HALL with built in cloak cupboard, stairs to first floor with understairs cupboard, keypad alarm system. DIING ROOM A bright, twin aspect room facing the garden accessed through double doors. CLOAKROOM WC, vanity hand basin, tiled flooring and 1/2 tiled walls. KITCHEN/DINER Well equipped with Rangemaster oven with 6 ring hob and extractor hood, 1 1/2 sink with mixer tap and drainer, integral Bosch dishwasher and freezer, a range of cupboards and worktop space, tiled flooring, dining area with enough space for a table and four chairs, French doors opening onto the patio. UTILITY ROOM with cupboards and worktop, steel sink with mixer tap & drainer, oil fired boiler, plumbing for washing machine and tumble dryer, door to rear garden. LOUNGE Attractive fireplace with woodburner, front facing sash window and French doors leading to the conservatory. STUDY A good size study or children's playroom with front facing window. CONSERVATORY Facing South to catch the most sun, with tiled flooring and 1/2 height brick wall. GALLARIED LANDING With front facing window and airing cupboard housing the hot water cylinder. 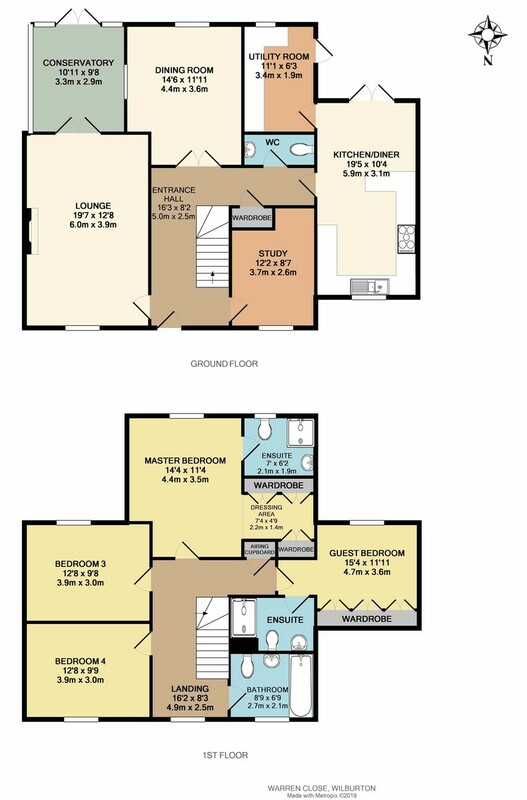 MASTER BEDROOM With separate dressing area containing three built in wardrobes, and fully tiled ensuite comprising of shower cubicle, WC, pedestal wash basin, inset spotlights, eactractor fan and rear facing window. GUEST BEDROOM Another double room facing the rear with triple fitted wardrobe and ensuite comprising of shower cubicle, WC, pedestal wash hand basin, 1/2 tiled walls and inset spotlights. BEDROOM 3 Another double room facing the rear with access to the loft. BEDROOM 4 A double room facing the front. BATHROOM Pedestal wash basin, panelled bath with shower attachment, WC, fully tiled walls, inset spotlights, extractor fan and front facing window.